water treatment « Global Market Insights, Inc. 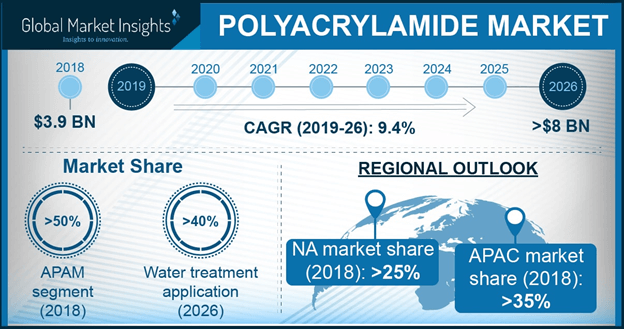 Global polyacrylamide market is set to rise at an unprecedented pace with the global population battling the catastrophe of water scarcity and depleting water resources. Recognized as an excellent flocculent, polyacrylamide is highly used as a water absorbing polymer in the treatment of waste water released from household and industrial sectors. 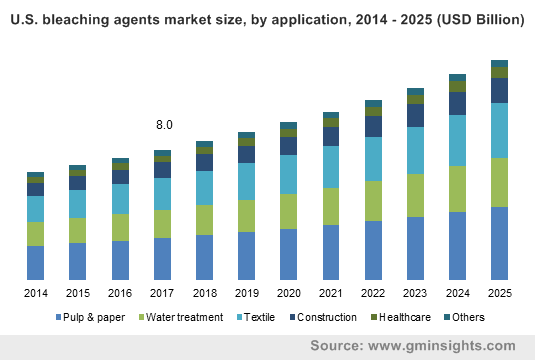 Polyacrylamide Market is further projected to gain strong footing with the formulation of stringent regulatory compliances pertaining toward waste water treatment. 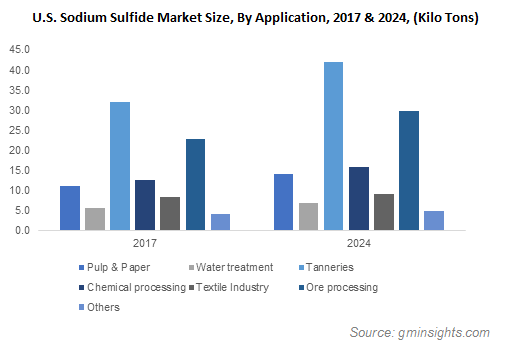 Such regulations coupled with the wide usage of this chemical in water treatment applications have left subsequent impact on the demand of polyacrylamide market, which was pegged at USD 5.5 billion in 2016. Below mentioned are most lucrative applications of polyacrylamide. The polluted water resources are one of the major concerns being addressed by the government and environmental bodies. Treatment and protection of water & sewage is closely linked to preservation of the environment and has received more attention from the regulatory bodies. Polyacrylamide, thus plays a very important role in the field of water treatment. Severe regulations imposed by the governments to treat the industrial waste water before releasing, has significantly contributed toward the growth of polyacrylamide market size. 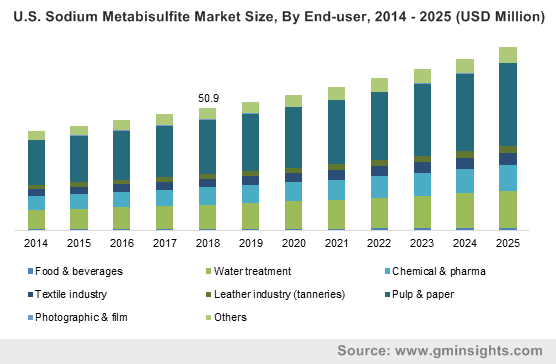 Estimates claims polyacrylamide industry size from water treatment applications to grow at an annual rate of 8% over 2017-2024. 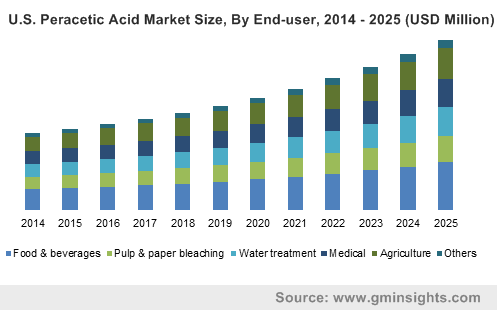 Geographically, Asia Pacific is one of the major growth avenues of polyacrylamide market, driven by vigorous initiatives in this region to conserve its natural water resources coupled with increasing waste water ratio due to rapid industrialization. As per the estimates, APAC is foreseen to exhibit a CAGR of 8% over 2017-2024, primarily driven by China, India, and Malaysia. China’s total waste water discharge has increased from 41.5 billion tones in 2000 to 68.5 billion tones in 2012, a significant raise of 65% over the period. Growing urbanization trends in the region has led to a raise in domestic wastewater volumes. China’s urbanization rate has soared from 36% to 53% over 2000-2012 and is anticipated to be over 60% by 2020. Subject to this fact, China polyacrylamide market is likely to witness a lucrative roadmap over the coming seven years. Polyacrylamide is extensively used in the oil industry to enhance the oil recovery and is prominently used as a drilling and fracturing fluid. Driven by this wide range of application spectrum, polyacrylamide market share from petroleum application is set to record a CAGR of 8.5% over 2017-2024. A significant rise in the demand for energy has impelled the exploration, production, and recovery of oil and petroleum on a large scale. For instance, prevailing shale oil & gas resources in the US have increased the demand for polyacrylamide for drilling activities. As per estimates, North America polyacrylamide market is set to double its market value from 2016 recorded at 1 billion to USD 2 billion by 2024. Considering the competitive scenario, the current trends demonstrate the engrossment of industry players in developing their product portfolios and expanding their global reach with mergers & acquisitions. Moreover, in the coming years companies are likely to focus on backward integration plans and on upgrading their current infrastructure to expand their production capacities for grabbing major industry share. For instance, a leading specialty chemical company Solenis, invested USD 5 million in its Russia manufacturing facility to upgrade its infrastructure. This has helped the unit to double its production capacity of polyacrylamide and efficiently exploit the enormous potential of this fraternity. Polyacrylamide market faces certain hindrances, especially, due to the carcinogenic nature of acrylamide monomer. Stringent norms regarding its use in some countries may act as a major roadblock to the growth of the market. However, manufactures are vigorously focusing on research & development activities for the development of various bio-based polyacrylamides, that will meet the environmental standards. The rapid product diversification and a broad range of applications pertaining to the polyacrylamide industry well justifies its profitability landscape. According to Global Market Insights, Inc. polyacrylamide market is slated to surpass a valuation of USD 10 billion by 2024. This entry was posted in Polymers and Advanced Materials and tagged Anionic [APAM], Cationic [CPAM], Non-ionic [NPAM], Paper Making, Petroleum, Polyacrylamide, Polyacrylamide Market, Polyacrylamide Market Analysis, Polyacrylamide Market Forecast, Polyacrylamide Market Growth, Polyacrylamide Market Outlook, Polyacrylamide Market PDF, Polyacrylamide Market Report, Polyacrylamide Market Share, Polyacrylamide Market Size, Polyacrylamide Market Trends, Polyacrylamide Market Update, water treatment. In a world consumed with the concern of reducing waste and bring down greenhouse gases emission, chitosan market has gained major prominence in the last couple of decades since the compound has proven to be one of the most ecofriendly biopolymers. Recently a group of bioengineers from University of Nottingham in UK have joined a counterpart team in Nile University, Egypt to develop a substitute for conventional plastic carry bags using chitosan. The biodegradable alternative will be designed to be greener than more conventional polythene derived from fossil fuels and can also be used to extend the shelf life of foodstuffs. Apparently, developing nations like Egypt have a major problem when it comes to disposal of plastic bags and reduction of water contamination. The use of bioplastics is not feasible in the African nation where most plants are grown for food and cotton. Chitosan, the man-made polymer derived shrimp shell, has emerged as viable solution for the production of a biopolymer nanocomposite material that can replace polyethene. The success of chitosan in Egypt can lead to British manufacturers opting for it as well which is eventually expected to lend a major boost to the chitosan market over 2018-2024. Chitosan is already a very recognized material in waste water treatment industry as well as food packaging industry. Research has demonstrated that the biopolymer chitosan can be used as a coagulating agent for organic compounds, toxic heavy metals and for adsorption of dyes and minor concentrations of phenols in various industrial wastewaters. Absorption in waste water treatment has been attracting scientific focus as it is a high efficiency, low cost method and absorbents are easily available. Driven by industrialization and urbanization, water pollution has become a major threat on Planet Earth. Chitosan industry has forged a remarkable growth avenue for itself as it has proved to be one of the most effective compounds for the removal of heavy metals or metalloids through adsorption. Chitosan market has also etched out a growth path through the development of edible alternatives in food packaging. Researchers are therefore developing packaging alternatives made of chitosan as an option that has the potential to replace plastic in the food and animal feed industries. As per the Australian Marine Debris Initiative Database, plastics constitute one of the biggest pollutants in the Australian waterways, with up to 130,000 tones winding up in the ocean each year. Researchers at the National University of Singapore have succeeded in developing an ecofriendly food packaging material that is chemical additives free by fortifying natural chitosan composite film with seed extract from grapefruit. This innovative food packaging material can impede fungal growth resulting in doubling the shelf life of perishable food. As such packaging options come to achieve mainstream acceptance, chitosan market is bound to register a growth influx over the ensuing years. The production procedure for chitin and chitosan involves use of hydrogen peroxide and high temperatures besides the use of aggressive agents, concentrated solutions of acids and sodium hydroxide. Large volumes of industrial wastewater containing acid and alkali are produced during the chemical treatment of chitin and chitosan. However, the compounds are used across a wide array of industries that include medicine, agriculture, cosmetics and food processing. Considering such applications and the relative eco friendliness of chitosan, extensive research and development is being conducted in the chitosan market to create a product that is not as harmful to the environment. Recently a research endeavor has succeeded in obtaining low-molecular-weight, water-soluble chitin and chitosan that relies on electron-beam plasma degradation of chitosan in a specialized plasma chemical reactor. The new technique not only has the advantage of being environmentally friendly but also reduces the time needed to produce water-soluble chitosan from several days to minutes. 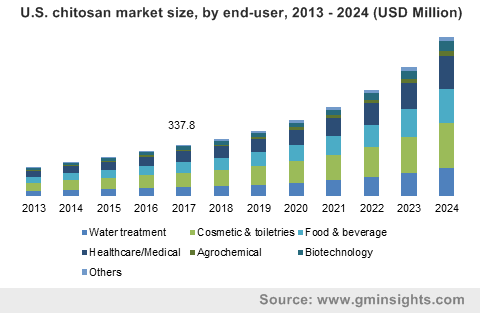 As more investments related to chitosan find their niche in R&D programs, it is imperative that the chitosan market will register a massive growth rate over 2018-2024. This entry was posted in Bulk & Specialty Chemicals and tagged Agrochemical, Biotechnology, Chitosan Market, Chitosan Market by Application, Chitosan Market Potential, Chitosan Market Report, Chitosan Market Size, Cosmetic & Toiletries, Crabs, Food & Beverage, Healthcare, Lobsters, Prawns, Shrimps, water treatment, Worldwide Chitosan Market.